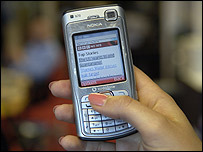 New rules to combat carousel fraud may be introduced as early as October 2006. HM Revenue & Customs (HMRC) says it is planning to change the system for collecting Value Added Tax (VAT) on certain imported electronic goods. The tax system will be altered so that VAT will only be collected when items are sold by a retailer. The change should remove the chance for criminals to charge retailers VAT on imported items only to deliberately fail to hand the tax over to HMRC. So-called carousel fraud has boomed in the last few years, and according to HMRC's own figures cost the UK between £1.1bn and £1.9bn in 2004/05. "We think this will have a very significant effect. It removes the mechanism by which the fraud can take place," said a spokeswoman for HMRC. The tax changes will affect a variety of electronic goods imported from within the European Union which are small and valuable. Among them will be mobile phones, MP3 players, computer chips, hard drives, handheld computers, games consoles, and satellite navigation equipment. The UK government asked the European Commission in January for permission to deviate from the Europe-wide VAT rules on the goods most commonly used in the fraud. The Commission is preparing to authorise the change and may do so this autumn. The new tax rules will require the agreement of all EU member states, but as carousel fraud is a Europe-wide phenomenon HMRC is confident it will be given the green light. The fraud depends on the ability of criminals legitimately to import goods free of VAT from within the European Union. They then charge VAT when they sell on the goods to the supply chain but instead of handing over the tax to HMRC they simply keep it and disappear. The losses are multiplied if the goods are then re-exported, allowing the final trader to reclaim VAT he has paid. If the goods go round and round in an elaborate circle through several countries - hence the name "carousel" - the losses to the government multiply rapidly. Could the North-East show the way to beat regional fraud?